By plane to Toulon- Hyères or Nice. The flight time to both is about two hours from various UK airports and it’s then a short drive to the vineyards. For more information www.visitvar.fr and provencewines.com. Sunflowers, lavender, olives, boules. Markets in the morning, rosé at lunch, dinner in still-warm, thyme-scented air under the stars. Everybody has a feel for the best known part of the south of France, but is any other place on earth so fuzzily defined? To purists, Provence is the solid slab of land stretching northwest of Marseille and Aix-en- Provence to embrace Arles, Avignon, Châteauneuf- du-Pape and the immense southern Rhône. The glitzier area to the east is the Côte d’Azur. 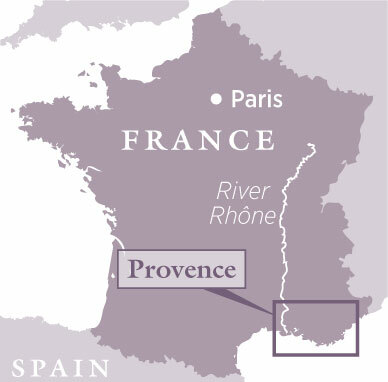 But in wine terms, Provence means Aix and a swathe of land stretching east to include Riviera landmarks like St-Tropez and St-Raphaël. The Vins de Provence umbrella shelters the Coteaux d’Aix-en-Provence, Côtes de Provence and Coteaux Varois appellations spreading over a chunk of the Bouches-du-Rhône and almost all of the Var. Confusing? Just a little. There’s no argument, though, about the fact that this is rosé territory. Serious rosé territory, both in terms of dominance (88% of production) and quality (ambitious wines, ambitiously priced) – yet well able to turn out stylish, ageworthy reds and distinctive, surprisingly fresh whites. Less well known, perhaps, in a part of the world so strongly identified with tourism, is that wine has remained embedded here for more than 2,000 years. Vineyards are as established a feature of the landscape as pink stone villages, palms, parasol pines and blindingly white, oversized yachts bobbing on the Med. It may all seem familiar yet, for many visitors, this Provence can unleash surprises. First and greatest may be the discovery, only minutes from the busy coast, of a vast, verdant hinterland. The back-country of the Var is green, not just with vineyards but with forests of chestnut and cork oak sheltering wild boar and – another surprise – the Hermann tortoise. Along its centre, the Argens river rushes through an emerald tunnel past the superb, half-hidden Abbaye du Thoronet to the sea. This medieval masterpiece, so moving in its stark simplicity, acts as a reminder that the entire region is stuffed with architectural and artistic gems spanning more centuries than there are shades of pink to describe its most celebrated wines. Where to start the treasure hunt? The cultural epicentre is Aix-en-Provence, a town so steeped in history and so richly endowed with gorgeous buildings that nobody with a smidgeon of aesthetic sensibility should assign it less than a couple of days. Founded by the Romans, who appreciated its hot springs, Aix flourished as the capital of Provence under Good King René in the 1400s. It prospered further in the 17th and 18th centuries when, as a major judicial centre, it acquired wide streets lined with enough mansions to house scads of wealthy lawyers. The decline which set in when Marseille outstripped it in importance was a blessing in disguise. The Sleeping Beauty, only reawoken in the 1970s, has kept almost all of her old allure. A tip: walk, walk, walk. Look at the elaborately carved figures flanking doorways; intricate wroughtiron balconies; the flamboyant fountains everywhere (no exaggeration: there are 50 – many low-sided, by the way, so that the sheep driven through Aix on their way to summer pasture could enjoy a drink). Metal studs in the pavement will remind you that this is also the town of Cézanne – without any of his works but with his studio intact. Its rugged backdrop is La Ste-Victoire, the mountain which he painted in such a new way that modern art was born. Picasso, drawn to it too, lies buried at its foot. Aix’s patronage of the arts finds parallels across the region, as you’d expect of a summer playground popular with well-heeled visitors from Queen Victoria through to designer Karl Lagerfeld. You can still admire extraordinarily lavish Victorian villas in the handsome old holiday resort of Hyères, as well as 20th-century extravaganzas like Villa Noailles – Art Deco in period yet daringly ahead of its time. Even wine estates are showcases for art. Along the coast, creativity finds expression in a succession of lavish gardens. Suppose you aren’t into art, or architecture, or history, or horticulture? Hardly a problem. With centuries of practice this part of France knows how to cosset visitors – so you could probably be content to sit in a pretty little town like Sanary-sur-Mer with its pointy-prowed fishing boats, or Bormes-les- Mimosas with its bougainvillea-draped terraces, and do absolutely nothing. Except contemplate lunch or dinner, perhaps. Restaurants abound, topped by a layer of Michelin-starred establishments as tempting to crack into as the caramel on a lavender-scented crème brûlée. About the jet-set, though… isn’t it kind of reassuring to catch a glimpse of celebs such as Jack Nicholson or Kate Moss sipping a pale Provençal rosé in some unobtrusive little St-Trop bar?